This article will tell you a lot of things related to skin care treatment. But before we get into that, we’d like to start from the stage of skin cancer, which is about to tell patients how far the cancer has spread through the body. Moreover, type of treatment will be chosen based on the stage of cancer. Doctors or specialists will be likely to carry out result of tests in order to measure the stage of cancer. However, in most cases basal cells don’t need such thing as staging, for it is not dangerous and rarely spread to other parts or organ. In stage 0 and 1, there is no high risk features. Stage 0 usually defines as pre malignant or pre cancerous. The cancer cells are existing but they haven’t spread to other part of body yet. Meanwhile, stage 1 means cancer has grown to 2cm with 1 or no high risk appears. Things become worst if skin cancers have developed to stage 2, 3, and 4, as all of them reveal the sign of cancer with high risk features. Furthermore, people with stage 2, 3, or 4 of skin cancer means that cancers have spread through other part of body. Skin cancer treatment, then, will be adjusted to one condition and which stage s/he into. Main treatments involve several technique/method including PDT (Photodynamic Therapy), Immunotherapy, Chemotherapy, Radiotherapy, and surgery. In general, most Squamous and basal cell skin cancers can be removed completely with surgery. 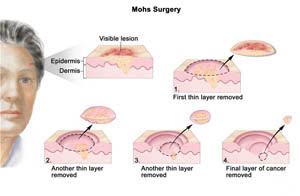 Although surgery became general technique to remove skin cancer, it depends on the stage of cancer, location of cancer, size of cancer, and type of cancer. In conclusion, if one is suspected of having skin cancer, s/he will be referred to dermatologist for diagnosis and skin cancer treatment.